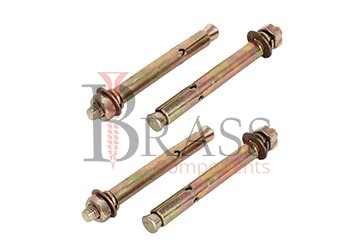 Sleeve Anchors are made from Carbon Steel, Stainless Steel, Free Cutting Brass, Leaded Brass, 301 Stainless Steel or Aluminium which are passivated and tested to ASTM and other International Standards. The Standard range of Sleeve anchors are widely used for concrete and brick. They are available with Chrome, Zinc, Tin, Electrolytic Tin, Copper, Natural Brass or any type of coating as per custom requirements. Sleeve Anchors are also available in hex-head, flat or round sleeve anchors. They are available in any metric or imperial sizes as per Custom Specification. Sleeve anchors allow Easy through-type fastening. Also known as stud Type Anchors. The range of Sleeve Anchors are available in four head styles including Hex, Flat, Acorn and Round. Integral collapse feature to ensure maximum clamping force to the fixture. Sleeve Anchors feature a split expansion sleeve over a threaded stud bolt body and integral expander, nut and washer. Sleeve design improves holding power. Pre-assembled sleeve anchor for easy and fast installation. Sleeve Anchors provide optimum mechanical fixation. Ensure durable and reliable fastening. Sleeve Anchors are available in different configurations with wide range of lengths and sizes for a multitude of applications. Tested to ASTM E488 criteria and made accordance to ANSI B212-15-1994. Suitable for light to heavy duty fastening purposes. Sleeve Anchors designed for pre-mounting. Used to connect objects and structural elements to concrete. Sleeve Anchors are inserted into pre-drilled holes in masonry materials where they expand for a secure fit, anchoring objects to the concrete or brick. For used in low weight applications in cracked or non-cracked concrete. Sleeve Anchors are suitable for various base materials due to the expansion principle employed. Suitable for wide range of temporary applications, fastening small items, etc. We manufacture Sleeve Anchors as per Custom Specification and export in Germany, Spain, Netherlands, Portugal, UK and other European Countries. For more Information, Please Contact Us or Inquiry Now.